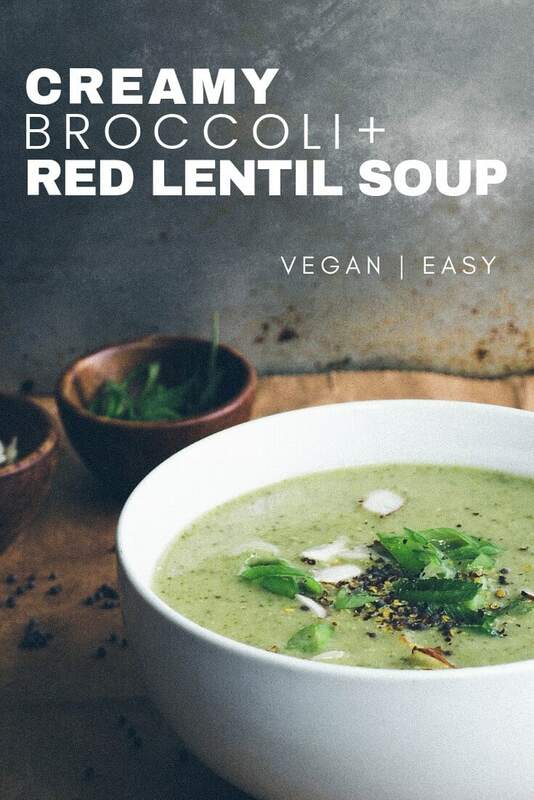 With a ton of broccoli I had on hand that needed to be used up, I thought this would be a perfect time to add this vegan creamy broccoli & red lentil soup to the recipe collection. Seeing that my last soup, Butternut Squash + Red Lentil Soup, was so good with the addition of lentils, I decided to add them to this soup as well! Lentils add bulk, heartiness and boost the nutritional profile by adding protein and good carbohydrates. They cook fast too, so you can pull this recipe together in about 40 minutes from start to finish. It’s also a one-pot meal which I love – less dishes is always a plus! I was inspired by two recipes, one from 101 Cookbooks and the other, Green Kitchen Stories. Both simple and delicious! I especially love the Savory Corn Biscuit recipe included in the GK Stories recipe, which I had a chance to make. Because I didn’t have the non-dairy yogurt on hand, I subbed unsweetened almond milk. They were still delicious without the yogurt, so easy to make and a perfect accompaniment to the soup! On a side note: I’ve updated a couple soup recipes over the last week or so. If you need some more soup inspiration take a look at these: Roasted Fennel & Potato Soup, Roasted Butternut Squash Soup, Parsnip & Split Pea Soup: Slow Cooker or Stove Top and this Curry Lentil & Greens Soup. Each one is delicious…check em out! We know broccoli is a nutrient dense vegetable. Rich in fiber, vitamin k & C and folate, its deep color holds many health benefits. I often eat it simply steamed with a dollop of hummus and a little sambal oelek. Once mixed, the combination is creamy, slightly spicy and delicious! Having it here in a soup is a nice change up, especially with soup season under way. See all recipes on TSV using broccoli! I love red lentils and their ability to blend easily in pureed soups. They add fiber, protein and cook up very light as to not alter the color of the soup as much as if using green/brown lentils. I would suggest sourcing and keeping red lentils in your pantry at all times. They are reasonable at about $2 to $3 a pound and will make dishes more nutrient dense when added. Find all red lentil recipes on TSV! Because we can never have too many great soup recipes that are well-balanced and easy to make. Try these other delicious recipes to keep it varied. Simple and flavorful! Red lentils add protein and bulk to this creamy broccoli soup without overpowering flavor or color. In a large dutch oven or stock pot, heat oil/water over medium heat, add onion and cook until translucent, about 5 minutes. Add garlic and red pepper flakes, cook another minute or until fragrant. Add lentils, broccoli, broth/water and optional coconut milk. Turn heat to high and bring to a boil, using the back of a fork or spoon press the broccoli down as much as you can to cover with liquids. Cover pot with lid, reduce heat to low and simmer for 15 – 20 minutes. Soup is done when lentils are tender. Taste soup, add salt as needed. Serve in individual bowls topped with mustard seeds, scallions and almonds. Pairs great with crusty bread or biscuits of choice. If you have a lemon on hand, add a squeeze to your soup for added brightness. If using pre-cut packaged broccoli, use about 1 1/2 – 2 pounds or 8 – 10 cups.You may feel there is not enough water, and most likely all the broccoli won’t be covered by the liquids at first. As it cooks it will soften and sink down, and any that doesn’t will steam and become soft. If you like you can push the broccoli down half way through cooking. If adding a whole can of coconut milk, start with the lower amount of liquids adding more as needed. If you don’t use veggie broth or have run out of an onion and/or garlic. Try adding 1 teaspoon each of garlic and/or onion powder. I recommend sticking with red lentils but you can use green/brown lentils if needed. Cook same as above but simmer for 30 – 35 minutes, or until lentils are tender. Your soup may look a bit muddy but flavor will be good. Use full-fat or light coconut milk. If you’d prefer, use up to 1 cup or so of unsweetened almond milk. Love this recipe – FYI – definitely use low fat coconut, the regular makes the soup a little too thick. This is my favourite broccoli soup recipe I have ever used! So good and so healthy! I love this soup and so does my family. For some extra texture, I make some vegan mashed potatoes and put a big scoop of them in the centre of the bowl. But any way you make this soup, its going to be amazing. Thank you for such a delicious and healthy recipe! I made this last night for the family and it turned out great. Super easy and tasty. I also love that there are very few ingredients and they are ones we almost always have on hand which mankes this reicpe inexpenisve and convenient. This reicpe is a much healthier and vegan friendly versoion of my mom’s cream of broccoli soup which I haven’t had for years since I’ve been vegan/vegetarian. Thanks again Julie for reminding us that eating simply and kindly does not mean wae have to sacrifice flavor or convenience! Keep up the wonderful work. I’m on here daily findin new inspirations from you.LOVE your site! Sorry for the delayed response Jodie. Yes, you can freeze this and let it thaw in the refrigerator. Go ahead and make some, you’re going to love it! Would it be ok to use sprouted lentils instead? And if so, how should I adjust for cooking time (if required)? I’ve never used sprouted lentils so I can’t say but after a quick google search it looks like you will be fine using them and cooking the soup as directed in accordance with what color lentils you are using. Red lentils only need about 20 -25 minutes. Brown lentils need apprx. 45 minutes. Hope it turns out well! I would suggest about 1 1/2 to 1 3/4 cups. Enjoy! We just tried this with fresh broccoli from our garden and it was delicious! I wasn't sure about it until we added the coconut milk and it really brought the kind of odd flavors together – WE REALLY ENJOYED! Does the soup pick up coconut flavor from the coconut milk? I've never been a fan of coconut. Can you use frozen broccoli? I wasn't sure if that's what you were referring to when you said packaged. Thanks so much for the clarifications. Mm, I am very intrigued by the crushed mustard seeds. What an innovative addition- I'll have to try them out on top of soups. YUM! I have all of these ingredients just sitting in my house, begging to be made into a soup! I've actually never made broccoli soup, so now I'm so keen to try it!! The only thing I don't have is mustard seeds – might need to go and get those!